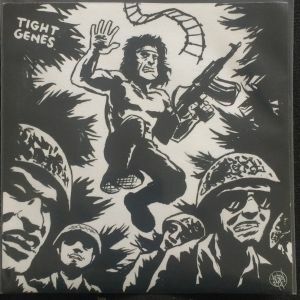 TIGHT GENES have reemerged from the grizzly swamps of Orlando, FL bearing a brand new 7″ EP released by the tasteful humans at Ken Rock Records in Sweden. We last heard from this wild crew when they released their debut 7″ on Goodbye Boozy Records. Unfortunately they’ve kept quiet for over 2 years, but these guys would fit in seamlessly on the catalog list for a now-sparingly active Florida’s Dying Records. The others showcase a darker and strictly punk attack, sustaining an explosive onslaught for almost 5 minutes through 3 obliterating tracks. Opener “Beach Bum Strangler” comes with a menacing carnival-esque twist stemming from the gooey synthesizers. A fiery guitar hook is woven throughout, providing the track with a meddling psych undertone that you wouldn’t want to piss off for fear of being eaten alive. They continue the horror in the one-minute hot-shot “Shoot the Messenger,” built with fist-in-air chanting and a stampede of rumbling percussion. Listen to “Viet Nam” and “Gay for School” right below – if that’s not enough, you’re better off scooping up that 7″ to hear the rest. Posted on December 12, 2014 by styrofoamdronePosted in 7", EP, ReviewsTagged 2014, garage rock, Ken Rock Records, punk, Tight Genes, Viet Songs for Viet Kongs.